I was trying to do another installation test after having previously done a full disk btrfs install. 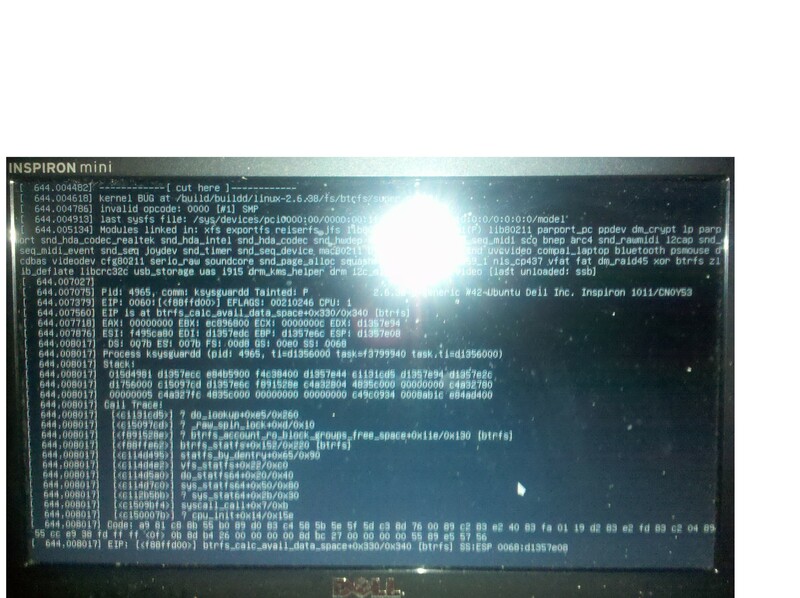 It appears as soon as Ubiquity tries to access the existing btrfs partition, the kernel dies. This is repeatable. I can't do ubuntu-bug -p linux from the dead system. I took a picture of the screen with my camera. I'll attach those shots (not sure which is the most readable). I had to manually delete the btrfs partition from a live session to get around this bug. I'm running into the same bug, only that in my case the kernel does not crash completely, so I'm attaching the output in text form. To reproduce the but, I created a new btrfs file system (on a lvm2 partition) and mounted it. The bug can then be triggered by running "df -h". I have a similar issue when trying to install to a fresh brtfs partition in the live installer. It partitions just fine, but when it starts copying files it crashes to the live desktop. It's not the same line in the source code, but that might be due to new code having been added, so it might even be a duplicate.